BulbapediaWell, where to begin. I guess I’ll introduce myself. My name is Andy. Around here, I go by airhawk06. At the ‘Gym I go by ajhawk. Let me continue by acknowledging one of my biggest flaws: sticking my foot in my mouth. I do this more than I should on the boards. Nothing too bad, but mostly just getting overly defensive. I apologize to any of you that I have done this too. I am working on it. Now, as for my Pokémon career, I am a relatively unknown player. When the game debuted in 1998, I instantly loved it. The only problem was that I lived in the middle of nowhere and my parents were not completely into driving me around for tournaments. So, I was mostly relegated to playing with my friend and at the card shop 20-ish minutes away. The shop was not an official league, so no official tournaments for us. Then Yu-Gi-Oh came out and I got into that. Then came spots. I love sports and played as many as I could. Fast-forward to my college years and I found myself at MIZZOU. There I met the local Pokémon league owner. He found out that I used to play and asked me to help, and I did. My first competitive event was Missouri States 2011 with a Charizard AR deck that only had 3 Rare Candy and 0 Broken Time-Space because I didn’t have any. I went 3-3 drop. Then at Regionals I played MagneRock and went 4-4 and misplayed in a huge way Round 8 to miss cut. Then at Nationals 2011 I went 9-0 Swiss. I thought that, maybe, just maybe I had broken through. I really felt that I played a near flawless tournament to that point. Then, I completely gave away the first game in Top 128 and got Turn-2-Magnezone-Donked in game two, and the ride came crashing down. Looking back on that day, I got too comfortable. I got too confident. I made a really stupid misplay. So, with renewed humility I went back home and continued to grow as a player. This season I have played 1 BR (which I won), 1 round at Regionals in a day that went comically bad, and 1 City (7th place, the tourny started at 1 PM and I found out at 12:30 PM I could go). For the time being, I am working on practicing and testing. I am hopeful I will get to go to two States, and I am planning on hitting up some Battle Roads before Nats. So, that is my playing history. It does not even compare with the other UG writers we are blessed to read. (Alert: a little bragging here.) However, I have been voted into the Top 5 of the Writer of the Month poll every month since last July (that might need some fact checking… if I’ve missed the Top 5, it has only been by a place or two). In that time, I have two 1st places, two 2nds, and one 3rd (out of seven months). Unfortunately, Josh could not make his regular slot. I’m sure you all would rather listen him. Alas, you have me. (Hope your life settles down a little Josh, we miss reading your work. Also, good luck with everything, you have a lot going on.) Adam apparently trusts me to bring forward a quality article. Let’s find out if that trust is warranted. Be warned, this is a little bit scatter brained. The first and foremost, I want to talk about cards that are poised to have a great States run. Some of these cards you might be expecting, others you might not. Let’s just hope I am on top of it. Stadiums: I do not think that there is going to be a fully fledged Stadium war like in years past, but I do think it is an interesting sub-set of cards to watch out for. Celebi Prime/Mewtwo EX/Torandus EPO (CMT) is getting a lot of hype right now. 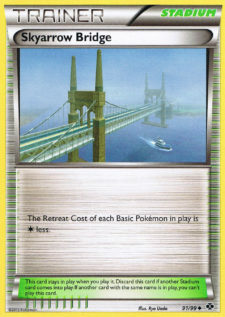 Furthermore, there is one card (of several) that makes the deck work: Skyarrow Bridge. Without the retreat aid, CMT gets really clunky, really fast. 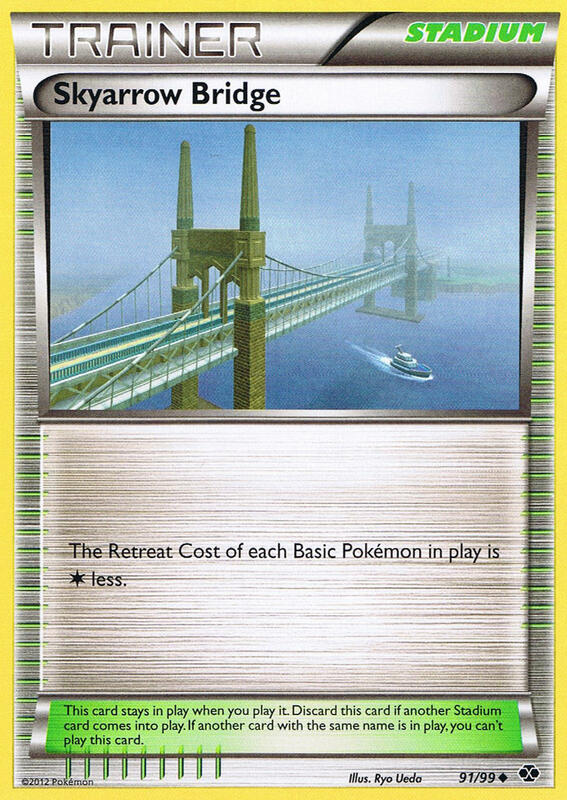 Celebi, Tornadus, and even the occasional Smeargle UD loses their free retreat when you ditch the Bridge. That means, if CMT shows up in droves, you may see other decks (that have a one or two “flex” spot) run a counter-Stadium just to spite CMT. Lost Remover: I’m sure most of you have heard this over and over. Lost Remover is very, VERY good in the upcoming meta. Just take a look at a lot of the lists floating around. Most of them run either 3-4 Double Colorless Energy or Prism Energy or Rescue Energy or Special Metal Energy. Shoot, some decks run combinations of those. In that type of environment, the ability to take an energy card from the field and remove it completely from play is epic. There is a great debate about what is the most disruptive card in the format. N and Pokémon Catcher are often considered to be the most disruptive. I would submit to you, in this format Lost Remover is not far behind, especially when you can combo it with Junk Arm. Basic Energy: This is the yang to Lost Remover’s yin. Because Special Energies are poised to see a rise in play, Lost Remover is poised to see a rise in play. Because Lost Remover will see a rise in play, decks that can function solely on Basic Energy inherently gain an advantage compared to the field. If you can operate without Special Energies, all of those Lost Removers floating around become dead draws and/or Junk Arm fodder to your opponent. This means that decks that utilize basic acceleration gain compared to the field (read: Magnezone/Eels, TyRam, Emboar, etc.). N: We all know what N does. However, I do not think most players recognize how powerful it is right now. Players who experienced Rocket’s Admin. will attest. EXs will make the game faster. You will be trading prizes faster. This really makes the comeback cards that much more powerful. N is the poster child for this. Pick Up Cards: I believe Dakota talked about these. There is virtually nothing (aside from type advantage matchups) that can reliably OHKO the EXs. So, if you can successfully pick up a damaged EX, will have denied your opponent two prizes. If you can take one or two prizes before Picking up an EX, you are in great shape. Look out for Seeker and Super Scoop Up. Mass Recovery Cards: Two cards in particular will like find a place in most decks, or at least I think they should. These two cards are Super Rod and Flower Shop Lady. Durant NVI is bound to see a rise in play. So, these two cards become key in buying yourself one or two more turns. Now, I want to talk about a couple rogue decks. I know that not everyone has/wants to play meta-decks. Well, here are two decks that most people could pull together. You can simply skip down a little bit if you want to get back to high tier, meta decks. Eevee: The Basic to the main attacker in the deck has a “Call for Family” attack. So, if you go first, you will not have to worry too much about losing on your opponent’s first turn. You will get another Basic in play. Foongus: The Basic of the status inflicter has a “Find a Friend” attack. 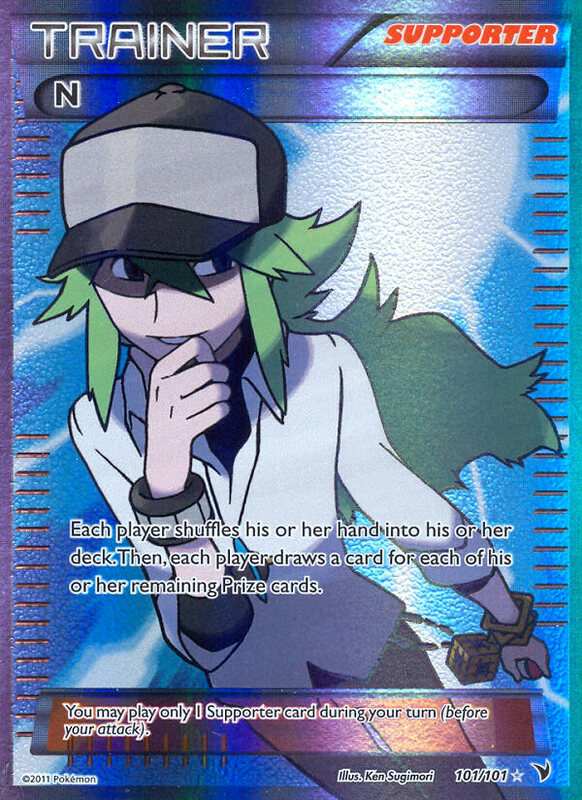 If you flip heads, you get to search your deck for any Pokémon, reveal it, and put it into your hand. It is not quite as good as Call for Family, but it is still a nice little consistency booster. Amoonguss: This is the evolution of Foongus. When Amoongus hits the field you can use its Pokémon Ability, “Sporprise.” Sporprise inflicts both Poison and Confusion to the defending Pokémon. Leafeon: This 90 HP Stage 1 is the main attacker in the deck. 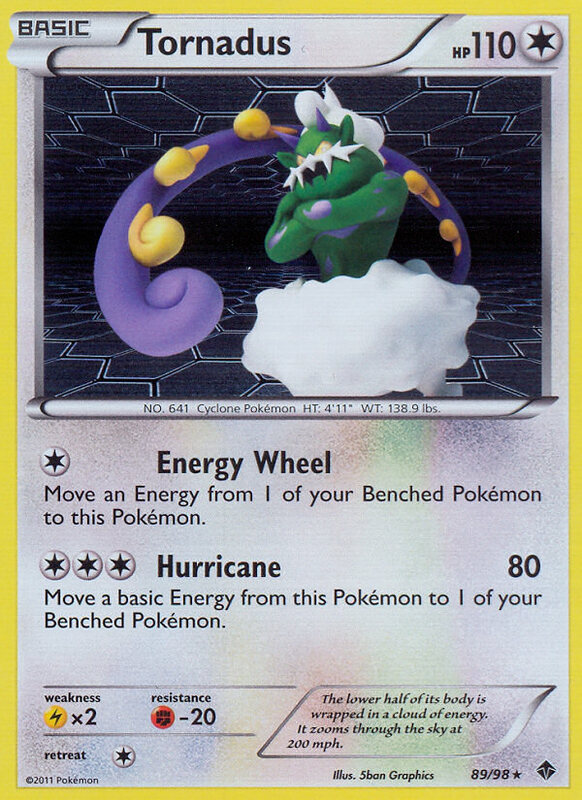 For C, “Miasma Wind” does 50 damage times the number of status effects the defending Pokémon is inflicted with. This means that most of the time you should be swinging for 100 + 10 for Poison each turn. That is plenty enough to 2HKO any Pokémon in the game. It should also be mentioned that Leafeon’s second attack is useful in some situations. It reduces the game to luck, but for G you deal 30 damage and put the defending Pokémon to Sleep. We all know how annoying Baby flips are, and this can put you into a similar situation. Espeon Prime: This is the other Eeveeloution in the deck. It is a 100 HP Psychic Pokémon. 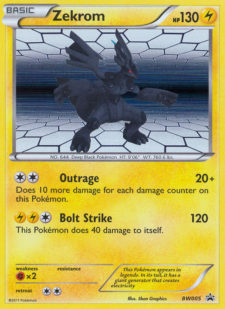 The main reason for this card is simply a Mewtwo EX counter. Its Poké-Body, “Evolution Memories,” allows Espeon to use the attacks of other Eeveeloutions in play. 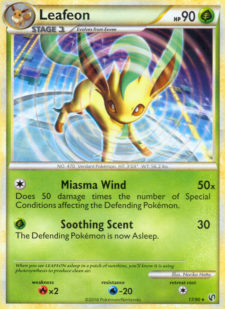 This means Espeon can use Miasma Wind and hit Mewtwo EX for 200 due to weakness. Cleffa: Just your standard crutch draw Pokémon. Pokémon Collector/Level Ball/Pokémon Communication: Unfortunately, Espeon has 100 HP. Everything else in the deck is at 90 HP or less. This makes Level Ball the premier individual search card for the deck. Seeker/Super Scoop Up: These two cards are the hinge of the deck. They allow you to pick up Amoonguss from the bench and reuse him. For as consistently as this deck sets up early, it can bog down in the mid-game. Right now, I have a 4/2 split. I think I would like a 4/3 split, but I need to cut a card in another place. Originally, I had a 3/3 split. I found I was hitting too many tails on Super Scoop Up and I always had difficult situations to use Seeker. Many times I desperately needed to pick up Amoonguss and use a different Supporter in the same turn. I upped the SSU count and it has worked a little better. 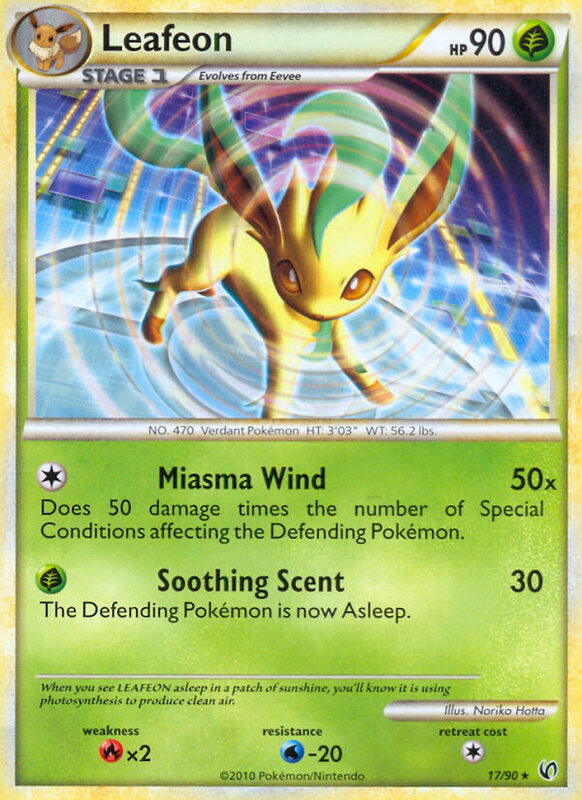 Rescue Energy: Since Miasma Wind runs on one colorless energy, Rescue Energy is a great fit. It allows you to recycle attackers effortlessly. Overall, I feel this is a solid deck. It will bet many other rogue concepts people show up with at States. Unfortunately, it tends to come up just short against the meta decks. Many people know this as Sharpedo Lock; however, the deck has grown beyond that. Pokemon ParadijsThis list give you three slots to play with. I will not devote a ton of space to this gimmicky deck. However, now there are two opportunities to lock your opponent out of the game. First, is the traditional turn two Strip Bare. We all know how the 44.4%-ish odds of hitting the double heads. Second, you can lock an opponent out of a game once he has taken 5 prizes. It is worth playing this deck just to pull this off once. There is not a single better troll opportunity out there. The simple idea is that you focus on giving up 5 prizes. However, you need to keep a Slowking ready. On your turn, you try to Lost Remover an energy or two. You get Shaymin EX into play with 2 energy. Then you play N. Then you use Second Sight to arrange your opponent’s top deck. Then you proceed to steamroll with Shaymin EX swinging for 180 till kingdom come. Admittedly, it does not work a ton, but I did want to toss it in for free. Now, I am going to talk about decks that just miss out of the Top 5, but can go far with a good list. Let me be clear, I think these are all decks that can work and can see results. I just do not think they are decks that deserve to be in the Top 5. I believe Dakota was the first one to really talk about this deck. However, I want to give my list and talk about it a little bit. This is looking more like a mash up of 6C and Electrode, and to a certain extent it is. Reshiram EX is the focus of the deck, although it may be hard to see that. The second idea is to get a loaded Mewtwo EX on turn two against set up decks. A fully loaded Reshiram EX on turn two with Eviolite and Victini is the optimal set up. I will defer most of the analysis to Dakota’s article. However, I want to talk about the differences. Research Record: The main problem with this deck, like so many other Electrode decks is that you can whiff on Energymite a couple of times and doom your chances. So, this card slightly helps to avoid that situations. Victini: I went down to one Victini. I found that most times the Eviolite on Reshiram EX is more important than hitting the correct flip. To me Victini is an added bonus. If you get it set up, great. 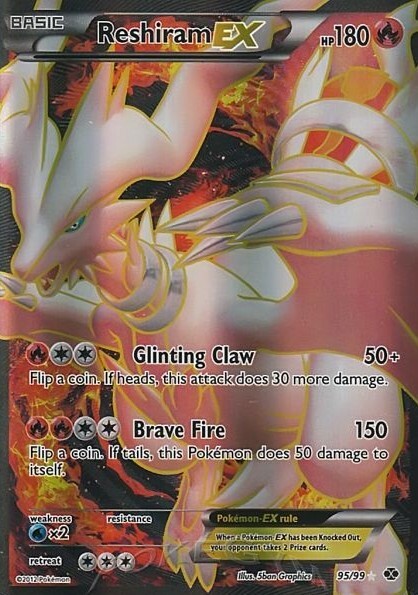 If not, you will still have a Reshiram EX with 150 HP (effective health of 170) staring your opponent down. A rinse and repeat 150 damage to the face is something not many decks can easily recover from. 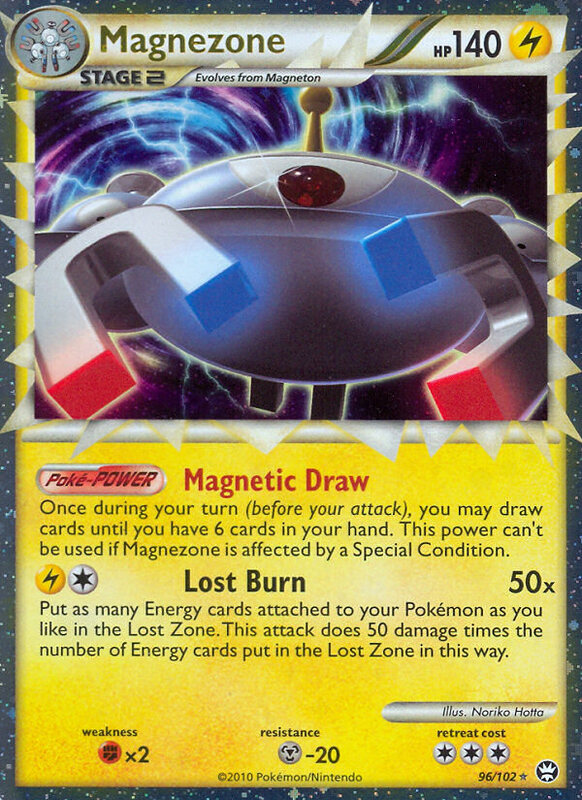 Terrakion: This is obviously here to help with the Magnezone Prime/Zekrom BLW/Zekrom EX match up. The ability to revenge OHKO all of those Pokémon for two energy is huge. You tend to want to drop Terrakion the turn before you think they will attack with a big lighting type. Ideally, you hit your Reshiram EX set up, so your opponent is forced to choose between attacking the Reshiram EX staring them down or to Catcher up Terrakion and take it out before it gets on a roll. I’m not too sure there is a correct answer to that situation. Mewtwo EX: It is just too good to not have. It gives you an instant 2 prizes against other Mewtwo EXs. It is also, in its own right, very dangerous when loaded on turn two with a ton of energy from Energymite. First, let’s talk about what made The Truth good. 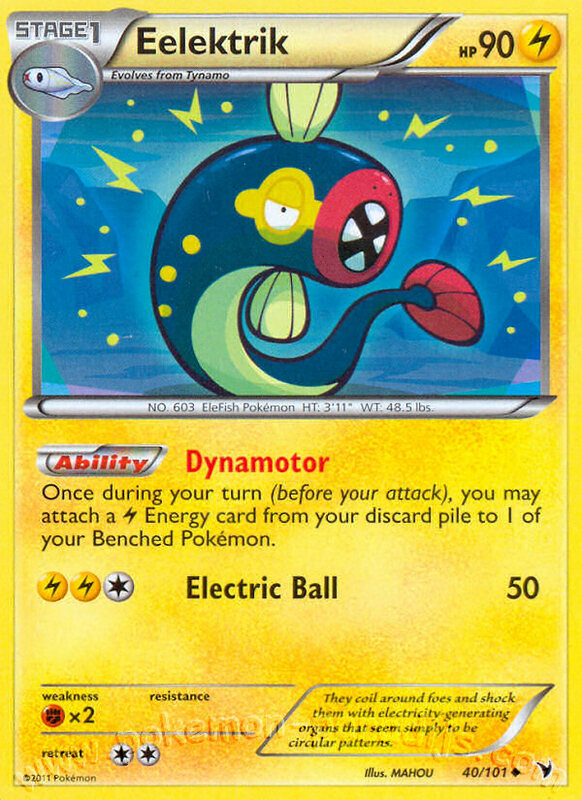 The key to the deck was being about to wall with high HP Pokémon that either could not be OHKO’d or forced Magnezone to drop a lot of energy to take prizes. However, the most important part of the deck was its type coverage. Well, that seems to be running out. The big Basic Pokémon of the last format (Terrakion, Kyurem, Dragons, Cobalion) that worked well in the Truth are all in OHKO range from Reshiram EX and Kyurem EX. This means the second pillar of the deck has taken a substantial deck. Does the first still work? I think the tank concept does still work. Furthermore, I think the two “worst” EXs have a nice comfy home in this deck. Let’s look at a list. Pokémon Center seems to be an interesting inclusion, but it works well. The idea is to you can use it to move heal 30 damage per turn. That might not seem like a ton, but hey, you just need to be able to mildly control the damage on the board. You also have the single Seeker to pick up damage from the board. 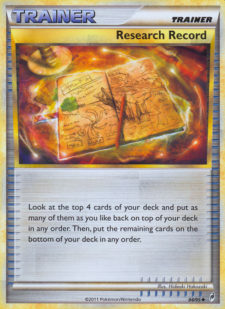 PokeGymAlso the basis of the deck “other” pillar of the deck has changed. You still have the HP wall in Kyurem EX and Gigas EX. There is nothing that can OHKO either of those two in the format (save type advantage). Gigas has the Outrage attack that can swing for a ton of damage. 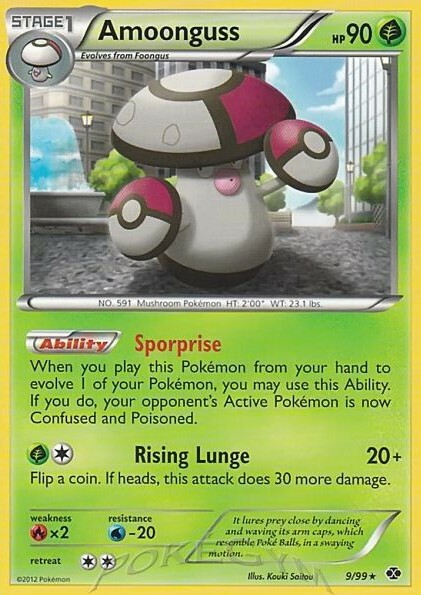 The hope is that Vileplume will disrupt your opponent’s set up enough to where you only need to take out one or two attackers. Well, you can use Regigigas EX to do just that. 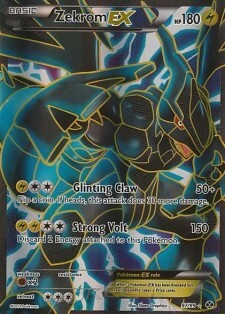 However, Kyurem EX is great in this deck. Kyurem also works as the new second “pillar” of the deck: energy removal. The idea is to use Frozen Wings to discard energy on one turn. 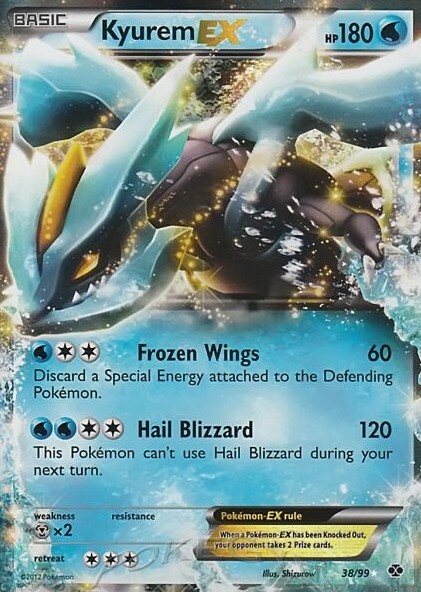 Then, on the next turn, you move the damage off Kyurem to Gigas and attack with Hail Blizzard for the second turn. That is 180 damage, which is enough to knock off any Pokémon in the format. The only Pokémon that really gives Kyurem fits is Cobalion, but the solution to that is simple: just don’t use Kyurem. Truck stop that Cobalion with Gigas EX. Against a swarmed field of Cobalion, you can leave 90 damage on Gigas EX when you attack. This makes Gigas outside of Cobalion’s range. It also allows you to swing with Raging Hammer for 140 damage. Also, The Truth used to really struggle with Durant. Well, the matchup is not favorable, but Regigigas EX is actually solid against the anteater. You can Gigas’ first attack, choose to do 20 damage, and OHKO a Durant (if they don’t have Eviolite). However, after two Giga Power attacks, Raging Hammer will be powerful enough to OHKO a Durant with Eviolite. Then after three Giga Powers you can OHKO a Durant with Eviolite and Special Metal Energy. 1. The thing that makes this deck work is type advantage against the field. It is true that we have almost every type covered, but you cannot know the proper allotment of each Pokémon to play adventurously toward the field. A two count of Terrakion is a safe bet because of Magnezone, but the other slots are still up in the air. 2. Kettler talked about this, and I fully agree. Reshiram EX and Zekrom EX can OHKO any of the non-EX Basics (most of them even with Eviolite). This makes energy hunting that much easier to accomplish. So, without energy acceleration you run out of steam quickly. The alternative is to solely use EX Basics, but then you lose the availability to hit the correct type advantages. A lot of people were really excited about Chandy getting a Fire type evolution to combat Durant. In addition, people were really excited about the solid match up with Mewtwo EX decks. Chandy is not weak to Psychic and it can use Eerie Glow to Burn/Confuse lock Mewtwo EX while doing 100 damage. On the surface, it would seem that Chandy is set to stay put at the top of the field. However, I really feel that Reshiram EX and Zekrom EX will be played widely. They are easier to get a hold of and fit in with several decks. This means that the Reshiram and Zekrom decks Chandy feasted on now have easy access to a 150 damage output. This means that Chandy will be getting OHKO’d by Basics. The ability to take is just no longer available. I expect it to be played. I expect it to beat most rogue decks. However, I really feel it will suffer at the top tables against the top decks/players. Pokemon ParadijsThis deck is more commonly known as Typholsion Prime/Magnezone Prime. It was semi-famously piloted to City success by Pooka. However, I feel that it losses a little bit on the meta. The concept behind the deck is excellent. You pair the premier attacker, the premier draw engine, and premier energy accelerator. However, Typhlosion and Magnezone are both slow and clunky Stage 2 Pokémon. The deck does run a couple of Reshiram to help with the energy requirements when attacking, but it is still extremely fragile. By contrast, the format has sped up. Both CMT and ZPST will be popular. Reshiram is still around. Zekrom/Eels is there and of course the faster Thunderdome is ever-present. The poor Cyndaquils and Magnemites will struggle even more than in recent formats. Furthermore, Magnezone and Typhlosion are now in easy OHKO range. I was asked in the forums if I thought that 150 damage was that important. I will use this deck to demonstrate why my answer was “yes.” The real strength of Magnezone last format was the ability to OHKO anything, while AT THE SAME TIME it was very difficult to OHKO. Thus, every Magnezone was taking a 2 for 1 exchange. Now, the EX Dragons can swing for 150 damage. This means that a Basic can trade with Magnezone, and Basics (even one with high energy requirements) are much easier to stream than a Stage 2 (oh how I wish BTS was still around). Now, let’s look at all the relevant Pokémon that found power from not being OHKO’d last format: Reshiram BLW, Zekrom BLW, Magnezone Prime, Donphan Prime, Machamp Prime, Tyranitar Prime, Cobalion NVI, Virizion NVI, Typhlosion Prime, Emboar BLW 20, Terrakion NVI, Kyurem NVI, RDL, and I’m sure I am missing some. Anyway, that list is sufficient to demonstrate exactly how important the 150 damage is. While 150 will not OHKO a ton of stuff in the States season, it is plenty enough to keep other Pokémon out of the limelight. Back to Red Zone: the reliance on small Basics, multiple Stage 2 lines, and the inability to effectively tank as much as previously, I feel have taken the deck a step backwards. 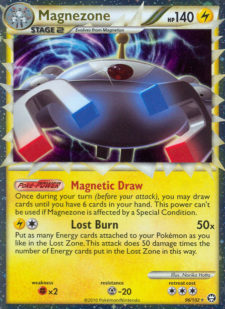 This is one of the alternative ways to run Magnezone. I put it by itself because it is much more closely related to MagneRock. Let’s look at a list. 1. Energy droughts are almost non-existent. In the old MagneRock archetype, you ran around 18 energy. This was enough to take 6 prizes assuming 110+ HP. Here you have 16 energy. This allows you to take five 3 energy prizes and one 1 energy prize. 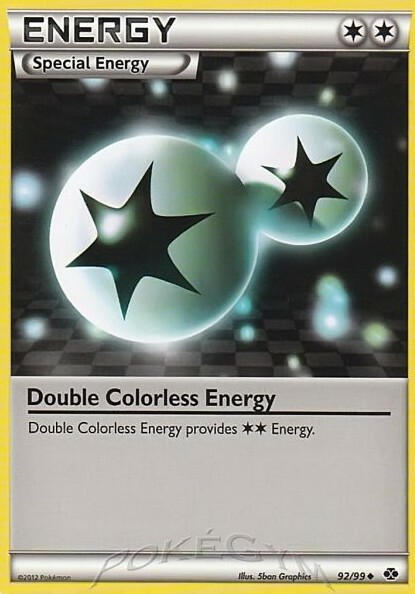 However, with EXs in the format, you will likely be able to steal two prizes for 4 energy at least once a game. With two Eelektrik and one manual drop, you can get three energy into play each turn easily. 3. You also have more options to get energy into the discard. There have been plenty of times where I desperately needed to discard and energy, but I only had a PONT or N in hand with the Thunderdome. By using a heavy Sage’s line and a heavy Engineer’s line (along with Junk Arm) you have plenty of opportunities to get energy in the discard. The list is unfortunately really tight. I do wish I could have a Super Rod and a fourth Eelektrik. The “other” Fire deck has gotten a lot of play recently. Certainly, the ability to energy dump all at one time without taking damage it very attractive. The ability to drop Mewtwo EX and/or Regigigas EX and power it up extremely fast is also huge. You also have the option to run RDL. RDL is a very impressive card in this format. If you finish off an EX with RDL, you get to take three prizes. This means that you could effectively end the game in two turns. It is highly unlike to happen, but that is a high reward play if you can pull it off. I know that Reshiram BLW actually works very against the EX Pokémon. However, Reshiram does not work really well with Emboar, or at least not as well as when it is paired with Typhlosion. So, we need to focus on what the deck does really well. Pokemon ParadijsThe main thing this deck does really well is drop a lot of energy in one turn. The key is to focus on getting big energy attackers into play in one turn. As you can see, the problem with this deck is that we play with 60 cards. This deck really needs a bit more draw and another Cilan or two. However, there is not really anything we can take out. We need Switch because of the crazy high retreat costs. We need the balance of “engine” Supporters to keep the game rolling. We could talk about this deck a lot more, but we just run into too many problems right now. I think I agree with Kettler on this deck. I feel about the same as I do with Red Zone, but worse. You run into the same clunkiness with the energy recovery and the energy search cards. Typhlosion just frees up 2-4 slots compared to Emboar. Typhlosion is also more flexible in its energy recovery abilities, getting to place the energy anywhere on the field. The retreat cost is also more manageable, and its attack is better. We could spend thousands of words to this debate, but now is not the time for that. Basically, this deck has become very fragile and slow. I will first talk about my affinity for the name. I love it. I know a lot of people don’t like it because of the Country Music Television, but I am from a small town. I know the list is a little unorthodox. It does work pretty well against a number of things. The Terrakion is infinitely useful against the big Lightning decks. It can be powered up in one turn with Celebi and Skyarrow Bridge. It can go on a rampage and take several prizes in the Lightning game. Pokemon ParadijsThe problem I have with this deck is that it fizzles in the late game. Just like the old ZPST, it can win the game early and run decks off the table. The big problem is that Tornadus and Mewtwo EX both specialize in the same aspect of the game; they are both dominating early game attackers. With the Celebi combo, you can reliably do 80 or 60 on turn one (turn two at the worse). 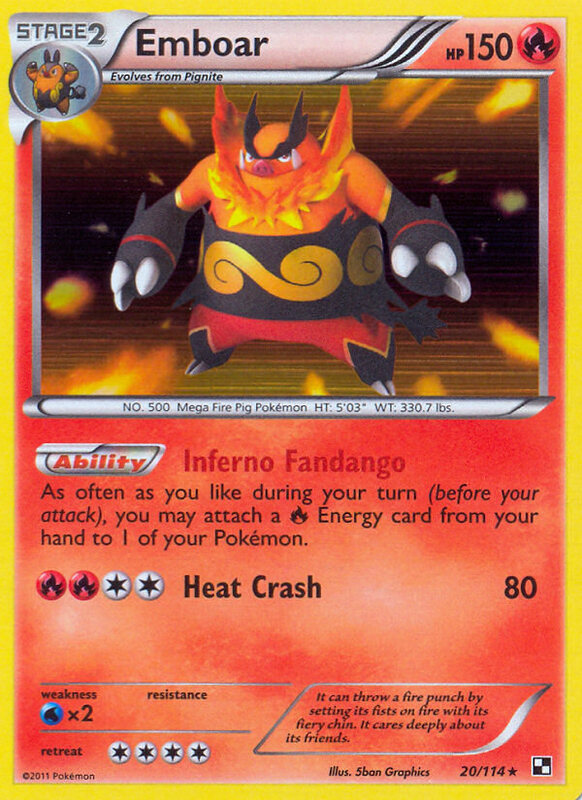 This works wonders against any deck that runs setup/support Pokémon. However, the deck lacks in late game potential. Mewtwo needs the opponent to have approximately 4 energy and to also have around 4 energy itself to deal significant damage. However, decks are adapting to this. With other Mewtwo EXs being tech into decks, putting 4 energy on your Mewtwo EX is just asking for going down two prizes. Then Tornadus is locked at 80 damage maximum. When compared to decks that can swing for 120-150 easily, you run into problems in the prize trade. 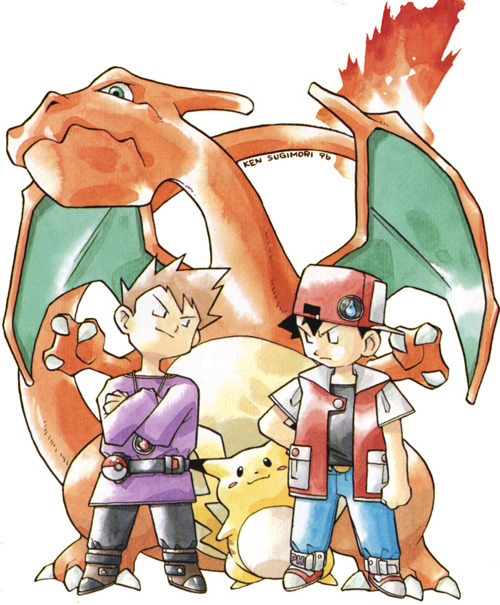 So, essentially you have two Pokémon who do the exact same thing effectively. To me this deck is getting overhyped compared to its actual place in the meta. Tornadus and Celebi are too easily knocked out by a lot of Pokémon and Mewtwo EX is one shot by other Mewtwo EXs and you run out of energy quickly. I know this is extremely similar to the last article, but I do not have the same decks in the top five. If you pay attention to PokémonDan’s videos, this deck had success in one of the first competitive events with Next Destinies. That list ran an EX trio. This is a bit more “turbo” version of the ZPST deck. By having Item-based Pokémon search, you get to focus on draw Trainers. The idea is that you can play out a hand full of Items then use PONT or Juniper to get a completely new hand. Pokemon ParadijsYou also have more toys to play with in the EX Pokémon. The deck is not completely out of luck against stuff like Chandy because you can swing for 150 with Zekrom EX. Mewtwo EX gives you an instant answer to opposing Mewtwo EXs. Regigigas gives you plenty of options to set up good plays. For example, against a Truth type deck you can get Gigas active and force them to attack into the big man. Then you can use Raging Hammer to attack back for a lot of damage. You will likely give up the Gigas, but to break a lock it could be worth it. For the people I talk to and the forums, people have shied away a little from using Zekrom EX in the early game. A lot of people are very afraid of the two energy discard. So, naturally my response was to just discard a DCE. Then people looked at me like, “Are you crazy?” But, you only have to look back as far as LuxChomp to see the benefit of discarding DCE to stream attacks. Garchomp C LV.X worked with this strategy. 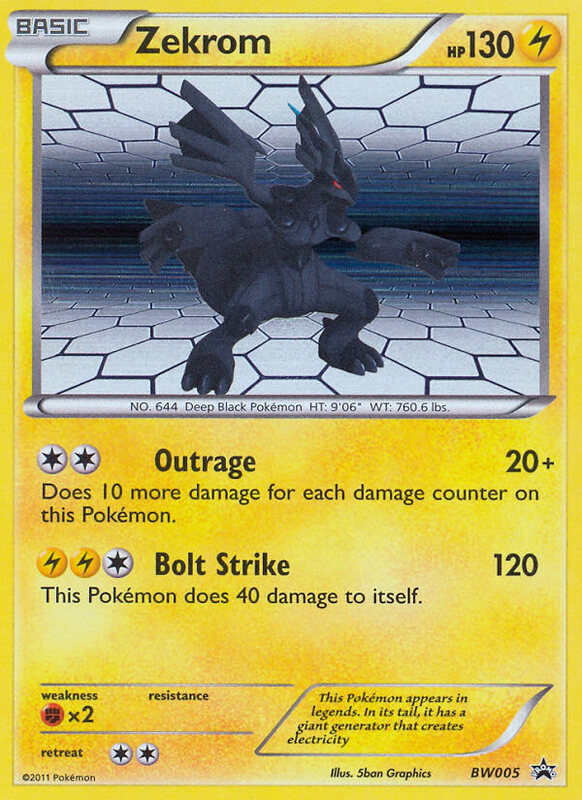 There is no reason why Zekrom EX cannot use this technique to its advantage. Can you imagine staring down 150 damage for several consistent turns to open the game? That is an extremely daunting situation. My list is several cards off from Fulop’s most recent list, but I feel it is in the correct direction. I have one less energy. Fifteen energy was just too many and I needed a little bit of room. The first place for me to cut was the energy lines. Pokemon ParadijsSecond, I do not focus on the EX attackers nearly as much. I have 3 Zekrom BLW and 3 Tornadus. Tornadus is an excellent early game attacker. By itself it can swing for 80 on turn two. Zekrom can 2HKO any attacker in the format. So, you only need the EXs in certain situations. Because the EXs do not need to be used, they can be taken down to one each. Even if one is prized, the game is not suddenly over. 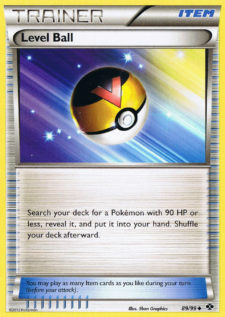 Third, I really feel that Level Ball is strictly better than Pokémon Communication in this deck. You do not need to have other Pokémon to make Level Ball work. Furthermore, the only cards that are not searched out with Collector are Eelektrik. Level Ball does fetch those nicely. Finally, I left out the Junipers in favor of Sage’s Training, PONT, and Pokégear 3.. I feel that both of those draw Supporters are superior to Juniper, especially in this deck. So, I wanted a way to get to them more often. When I was playing Juniper, I just had to discard too many things too often. That fact combined with lower counts of the EXs and PONT just works better for this list. Go ahead. Here come the homer calls. That’s ok. I stand by my belief that this is a very good deck. I will admit that the Thunderdome and Durant are likely the two best decks. 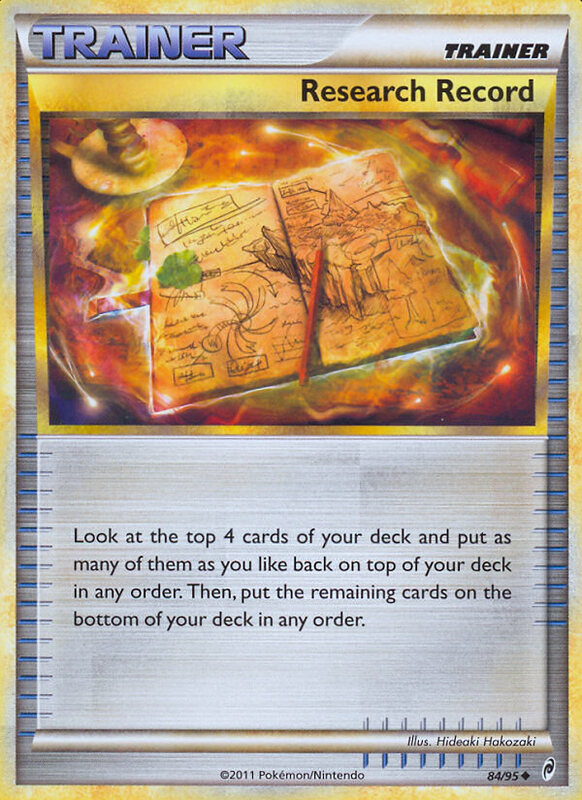 However, decks 3-7/8 are all jumbled together with no real separation. So, hey you are going to get some bias in assigning which deck come up behind the top two. That is only a 58 card list. It has worked for me. There are a few ways you can fill those slots. First, you can add a utility card like Rocky Helmet to help bring the Magnezone match up even closer. Second, you can add another 1/1 Ninetales line to help draw consistency. 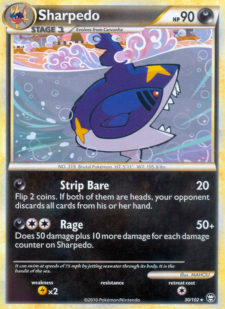 Third, you could add the fourth Rare Candy and another draw support/Pokégear 3.. All are viable options. Not being about to deal 140+ damage consistently. Not having a solid answer (in most people’s list) to Kyurem Spread. Well, one card changes both of those things: Reshiram EX. Yes, it can be a liability because there is the possibility of recoil from Brave Fire. However, you do not rely on Reshiram EX. Once or twice per game it is well worth it to take that risk. Many people say that Reshiram EX is naturally better with Emboar. To those people, I would say they are correct if you want to use a turn two or turn three Brave Fire. 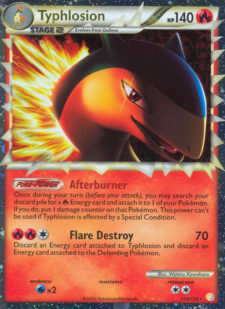 However, at all other times in the game, Typhlosion is superior (again). With DCE and two Typhlosions, you can drop Reshi EX and Brave Fire all in one turn. The other concern is about the Afterburner damage. Well, if you avoid taking the recoil, you still have 160 HP to work with. The only danger you are in is an attack from Zekrom EX or Reshi EX and PlusPower. On the other hand, if you take the recoil you are at 110 HP, but 130 HP is basically a sitting duck anyway. 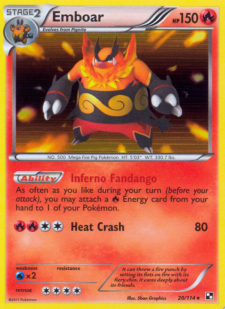 I think people are overstating exactly how much better Emboar is for Reshi EX, in the EXACT same way everyone over estimated Emboar’s “superiority” over Typhlosion when paired with Reshiram BLW. It is possibly the most consistent deck in the format. It has the best internal synergy in the format (the whole Roast Reveal -> Afterburner -> Blue Flare combo). It can stream 120+ damage better than almost any other deck. It has a splendid secondary attacker (Typhlosion). It can now swing for over the 140 mark. It theoretically can swing for variable amounts of damage, and trade with Mewtwo EXs through its own Mewtwo EX. In all honesty, this might be the best deck in the format. There are certainly a few decks that have favorable match ups against Durant, but nothing, not even TyRam just destroys it. 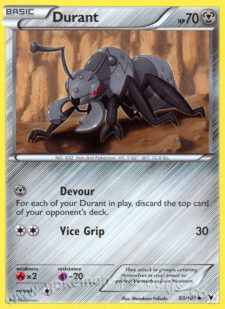 I really feel Durant needs to be an all or nothing type of deck. If you are not milling with Devour you are lessening your chances at winning. I completely understand putting Cobalion and Exp. Share into the deck for an alternative attacker. However, I think running a straight 4 Durant and 1 Rotom is the best way to play the deck. Pokemon ParadijsI personally like Level Ball over Dual Ball. Ideally, you are using Collector to score the “big grab” of Durants. From then on, you should be grabbing one at a time. The guaranteed one over a possible two is the winner in my book. 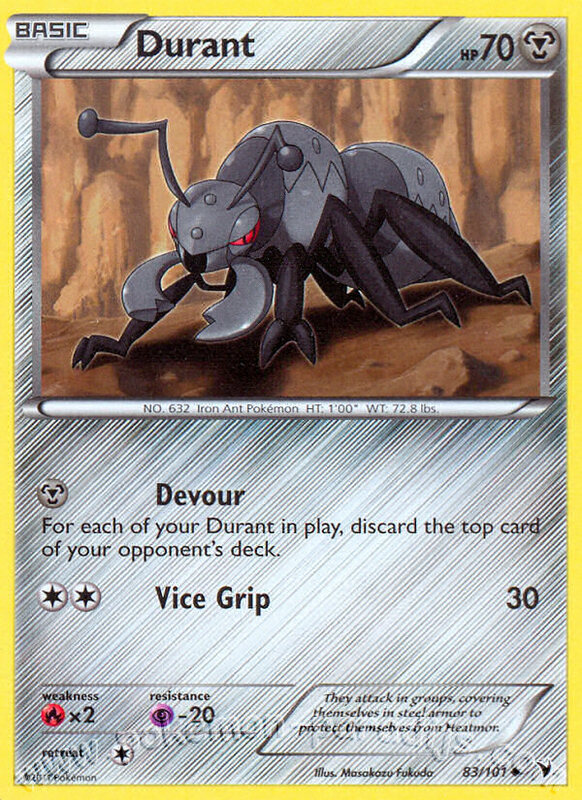 With players setting up a single attacker to deal with Durant, the Seeker + Catcher combo is deadly if they have some dead weight Poké on the bench. This can effectively gain you a couple turns of uncontested milling. Battle City is a fun 1 of in Durant. You can Twins for it relatively early in the game. It will allow you to draw more cards. You might trick your opponent into drawing extra cards (unlikely unless you happen to be at 0-X). However, the best part is that you can use Battle City right after Mischievous Trick to check if you got that crucial Durant. I also play around with the Lost Remover/Crushing Hammer counts. I feel that 3/3 is a nice balance when we are a little unsure of the coming format. If Special Energy become as big as some are predicting, adding the fourth Lost Remover might be helpful. I mentioned earlier that not even TyRam has a great time dealing with this deck. The thing that makes Durant good is that you can essentially luck your way out of bad matchups more than any other deck (even more than ZPST). Basically, when you sit down and flip over a Durant you have told your opponent, “You have until turn 3 to take a prize and take prizes every subsequent turn. If you fail, I likely win this game.” That is a huge pressure cooker. Also, you can just get lucky and mill your opponent’s answer to Durant. PokeGymWe have talked about this deck a ton already. Basically, if you want to see my list, go look at the list in the previous article. The only real difference I think I would point out would be the energy counts. I only play two DCE. I feel that this deck digs so fast that getting to a DCE is not a big deal. Furthermore, there are only two cards that need DCE. So, in general I try to match the number of attackers that use DCE with the number of DCE. Here there is one Zekrom EX and one Mewtwo EX. That makes two DCE. I also do not think four Rare Candy is a necessity. I firmly believe that three will work just fine. That gives us two free spaces. I would likely add a Switch (two total) and another Lighting Energy (11 total) to my list. Well, there you have it. I hope you all like this article. I would love to be back in the UG sometime. As for now, we all hope that Josh can make a triumphant return to his normal slot. I am sorry that it is a little bit shorter than the last few articles. Unfortunately, I only found out Thursday night I was writing this. Also, I spoke in-depth about some of these ideas in my last couple articles, and I tried to stay with more unique (for lack of a better word) content.